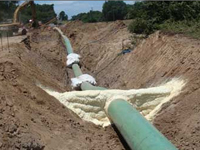 “We’ve replaced old-line products in many industries with TerraThane,” says Patrick Burchett, NCFI’s Geotechnical Product Manager. “In mudjacking we’re replacing the old ‘mud’ slurry with a pumped or injected polyurethane foam. Foamjacking is a much cleaner application, requires far less slab downtime for those companies doing roadways, bridge approach repair, and concrete slab lifting, leveling and void filling. They complete their jobs quicker and with less clean-up time. Most state departments of transportations have embraced the use of polyurethane. It’s making a major difference in how the bottom line looks to companies using the product in the field. Besides the uses mentioned by Burchett, TerraThane is in high demand for backfill and void fill, soil and rock stabilization, encasement, post and pole setting, crack and joint sealing, and mine reclamation. The company is headquartered in N.C., has manufacturing plants in UT, GA, and another in NC, and 14 distribution facilities across the U.S.
NCFI, headquartered in Mount Airy, NC since 1964, manufactures polyurethane foam chemical systems for spray foam-in-place insulation (SPF), roofing, geotechnical, marine floatation, packaging, specialty molding, and many other uses. The company also offers a complete line of flexible foams for furniture seating, transportation seating, bedding, carpet underlay, and packaging. NCFI also has manufacturing plants in Hickory, N.C., Dalton, GA., and Salt Lake City, UT. To learn more about NCFI please visit www.NCFI.com.